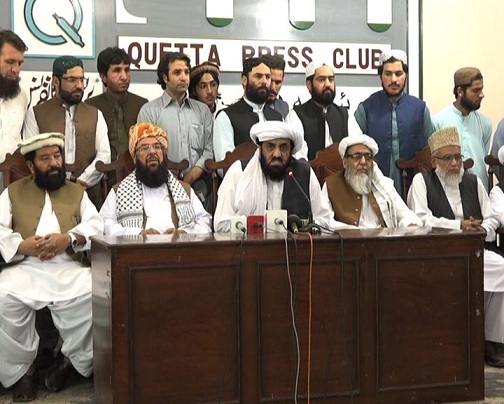 The Muttahida Majlis -e-Amal held a press conference on Wednesday in Quetta where it said that incidents that occurred during the 2013 elections seem to be springing up again but the MMA is not one to cower. Speaking at the press conference, Jamiat Ulema-e-Islam General Secretary Maulana Ghafoor Haidery, former senator Hafiz Hamdullah and other leaders said that the MMA will try to form a government. They said that in the next election, they will form the government and impose an Islamic system of government. Hamdullah said that before the elections, plans to rig the polls were made. He claimed that the Governor House in Quetta had become one political party’s media cell. With the caretaker set up and governor in place, clean elections are not possible, he said. This means all four provinces should get new governors.